Who is your target market? What are they looking for? You must answer these questions in order to build a website that will be an extension of your business. You want your website to be a virtual representation of your business model. This may be a virtual salesperson, an informative blog or a retail store. Regardless of the type of business, your website has but a few seconds to grab and hold your visitor’s attention. You need to place the information most relevant to your target market near the top of the home page and have it stand out like a billboard. Once you have their attention you can guide your visitor through the pages of your site like a boat down a river. Stun your visitors with bright, entertaining photos, graphics, animation and videos. There is nothing more boring than visiting a website jam packed with copy. Break up the words with images and graphics. Have your existing customers help by providing you with video testimonials. Stimulate your visitors with sight and sound. They will be more likely to stay on your site longer. The more time a visitor spend on your site means they are spending less time on a competitor’s site. Smartphones and tablets have changed the way we view websites. Any new website needs to be designed to function properly on all devices. This means that all design elements of the site need to be functional using a touchscreen. Additionally, the website needs to have the ability to automatically be resized and rendered appropriately on all devices. Visitors will quickly move past your website if they are constantly zooming in to read your content. Using a Content Management System (CMS) such as WordPress can significantly cut your website design and maintenance time. There are many free and paid website templates available to help you create and implement a website without any knowledge of coding. You can also add many functions using plugins such as basic Search Engine Optimization, mailing list integration, shopping cart functionality, blogs, etc. Using a CMS you can have a basic, professional looking website in as little as a few hours. Tell your existing customers about your new website. Do you have a mailing list? Mail them a link to your website. Spread the word over facebook, twitter, Google+, etc and encourage your followers to share it. Add the domain name (URL) to your business cards and any existing advertising. Place the URL on your letterhead and invoices. Hopefully this post provided you with some useful information on how to build a small business website on a budget. 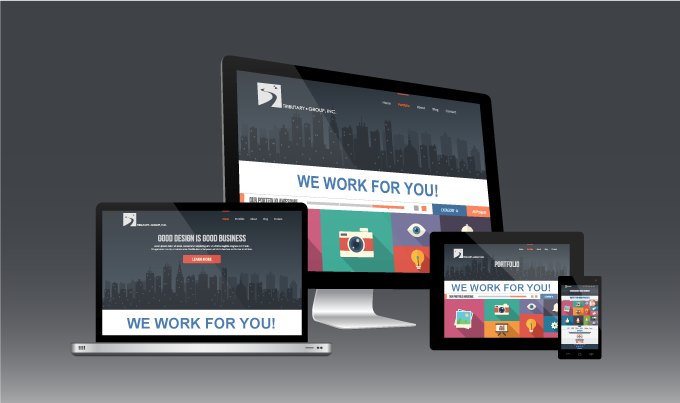 A great website doesn’t have to cost a fortune. If you remember to keep your target market in mind while designing your website it will go a long way to helping your business grow.